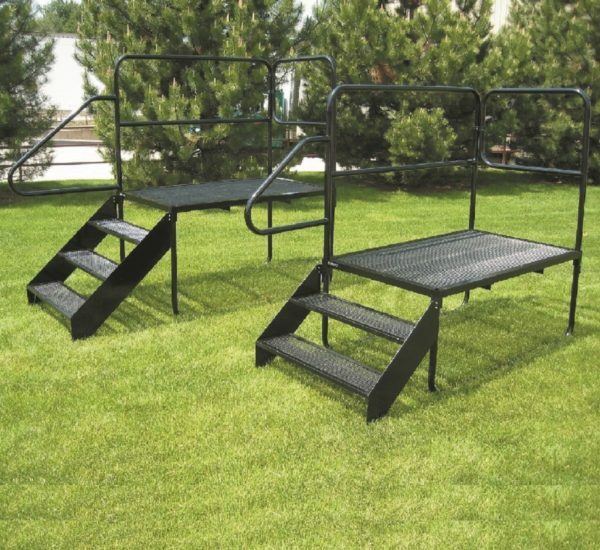 Office Steel Steps - Stromberg Carlson Products Inc.
Our steel steps provide years of service through the wear of heavy duty construction, industrial and/or commercial use. The open grate design allows mud, dirt, sand and snow to fall through – reducing maintenance on your interior flooring. The step assembly can be removed from the platform during transit to reduce the weight any one person is required to lift. Also, to maximize application, the 1-1/2″ handrails are interchangeable to either side of the step. 2 week lead time prior to shipping. Call Stromberg Carlson at 231-947-8600 for product cost, freight shipping costs and to order. 36″ square platform, 25.5″ H, 2 steps. 60″ deep x 36″ W platform, 25.5″ H, 2 steps. 36″ square platform, 34″ H, 3 steps. 60″ deep x 36″ W platform, 34″ H, 3 steps. Click on part number for dimensioned drawings.